The earliest known microscopes were a cylindrical tube supported by a small tripod, a pattern which continued in some form for over 200 years. This is a reproduction of one of a rare group of English instruments of the 1680′s. The tooling is in the manner of bookbindings of the period. A study of tooling motifs has shown that all late 17th century microscopes and telescopes were made by very few workshops whose products were retailed by many London shopkeepers. This instrument was reproduced from the original antique microscope #0141 in the McCormick Collection. From a dark hardwood circular base rise three turned brass pillars supporting the threaded horn collar which receives the nosepiece. For transparent specimens, the object is placed over the hole in the base and viewed by holding the microscope to a light source. For opaque specimens, an ivory disc is placed in the hole and the specimen placed on the disc. The outer pasteboard body tube is covered with red morocco, the inner with green vellum. Both are decorated with gold impressed tooling. A biconvex field lens is located at the top of the inner tube. The outer tube carries a wooden eye piece in which is a single lens. A single objective in wooden mount is screwed to the end of the nosepiece. Four additional objectives are supplied in a circular box which screws onto the eyepiece when the microscope is not in use. The microscope is focused by screwing the 2" long threaded nosepiece in and out of the collar. 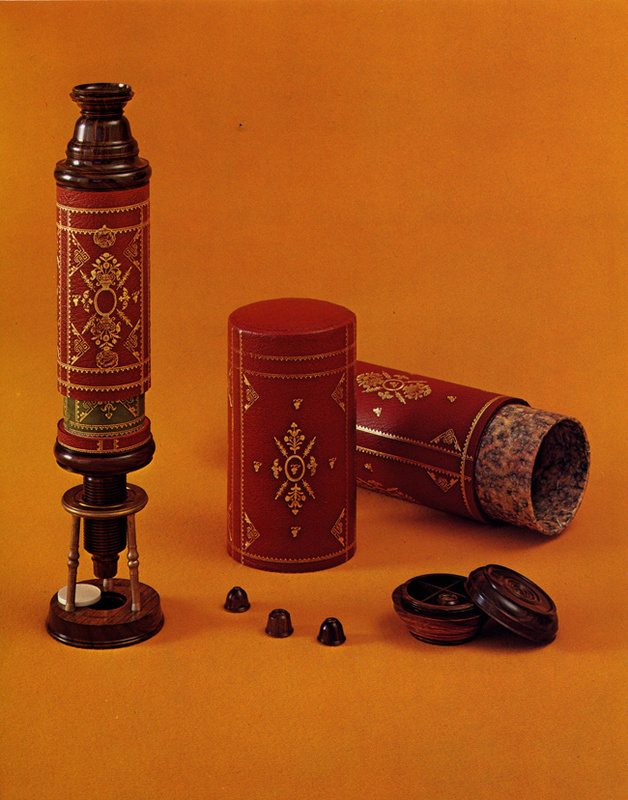 The circular cardboard case, 13 3/4" tall, is covered with red morocco and decorated in gold impressed tooling. The microscope stands 11" tall (nosepiece screwed all the way in) without its storage box top and 12" with the box top.